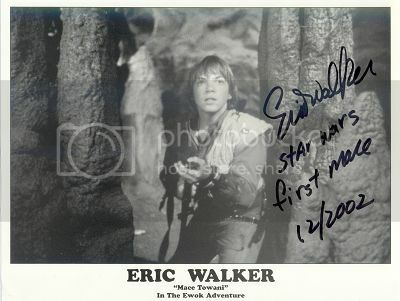 The part of Mace Towani was played by Eric Walker, with whom I had the following interview (that was originally published on Wattographs.com) in 2006. In the beginning of Battle for Endor your character gets killed by the Marauders. Did this feel as a disappointment and when did you find out that this would happen to Mace? In Ewok Adventure you were one of the two major characters, and now your part ended in such an unworthy way. Of course it was a big disappointment. I was originally told by Aubree Miller's parents that I was cut totally out of the movie and the biggest disappointment was that neither Lucas nor anyone at Lucasfilm bothered to tell me. I still remember my father sitting me down and telling me the bad news. It is a day I will never forget and I cried that night until I finally fell asleep. Then suddenly about a month later I got a call from my agent saying I was offered a smaller part in the movie. I was so happy to be apart of it that I jumped at the chance. I wanted to show the world that Mace would not go down easy but fighting! 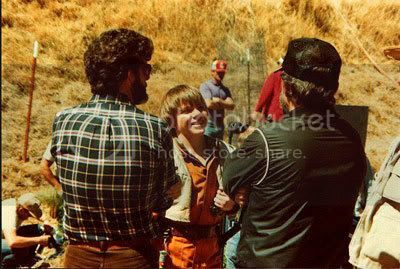 My whole experience with Lucasfilm as a boy is something I will go into great detail in a book that I am currently writing called, Growing Up On Skywalker Ranch. The book will feature a lot of information that no one knew about George Lucas and what really goes on at Lucasfilm, ILM, and Skywalker Ranch. The book will also have a never before seen DVD and making of the Ewok movie video that Warwick Davis and I shot and made while we were filming the Ewok movies. It will be a must for all Star Wars fans to ad to there collection as you will see a lot of stuff no one has seen inside of ILM and Lucasfilm. How did you get the part of Mace and how was it for a young old boy to get cast for a Star Wars spin-off movie? I auditioned in Los Angeles at the Egg Factory across the street from Universal Studios. It is no longer there but a subway station now. I actually have my original audition on video and it will be released with the making of DVD with my book. During that audition I did a monologue that caught George Lucas's eye. About two weeks later I had a screen test with Aubree Miller in Northern California and won the role. It all happened very fast, later I found out that they were looking for Mace for a long time and had auditions in New York, Los Angeles and San Francisco. Aubree Miller came from the San Francisco auditions. I was basically chosen out of thousands that were looked at for the role. Did you see the original trilogy when it hit theaters in the late seventies, early eighties? And did you have a lot of the toys? No, because I was too young. I did however see Return of the Jedi prior to getting the role of Mace Towani. I loved it and saw it about 10 times, so I was very aware of how special Star Wars was and I felt honored to be working for George Lucas. The first Star Wars name George Lucas came up with was Mace Windu; his name is featured in one of the first drafts of A New Hope. Was your character Mace Towani named after him? No. Mace Towani is Star Wars first Mace. He used the name again with Samuel Jackson because he liked the name. There is no truth to the rumor that Mace Windu was in the first drafts of A New Hope. Mace Windu was never mention in The Journal of the Whills or the first drafts of A New Hope. All that was added later. But if you know anyone that has one of the original scripts from 1973-1976 and not revised ones, they will tell you that Mace was added later. In fact a lot of Star Wars writers have done articles in magazines calling Eric Walker Star Wars first Mace. You can find the articles in the official Star Wars magazine of Germany and the U.K. 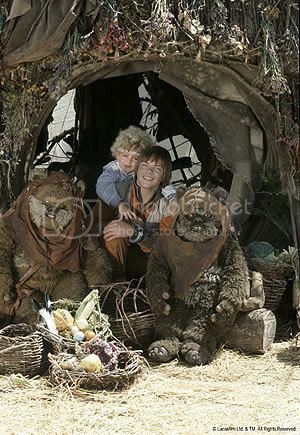 Most of the cast of Ewok Adventure were little people. Besides them it was Aubree Miller and you. How was it to work with this cast and have you kept in touch with them? Little people are some of the most down to earth people you will ever meet. They are very friendly and fun loving and almost always have the best sense of humor. I have kept in touch with Warwick Davis, Mike Edmonds, Dan Frishman and Kevin Thompson. Recently Aubree Miller and I attended her first ever convention in Ohio. I have pictures of us and Dan Frishman (Deej, Wicket's father) on my website at EricWalker.net. You were directed by John Korty and George Lucas was on the set too. Can you give us your opinion on both of them? John Korty is a wonderful actor's director. What that means is he knows something about acting and can really help an actor reach an emotion or get to where they have to in a scene. George Lucas did direct for a few weeks for the re-shoots because John Korty had a prior commitment so they said and could not make it. George is very technical and really knows how to set up a scene. When he is working on the set it runs fast and is less laid back then when John Korty directs. This is both good and bad. Lucas always has a lot of ideas about what he wants and sometimes comes up with them at the last possible second who creates on the spot trial and error. I remember sometimes he would give me the changes in his own handwriting the very morning we were shooting them, giving us very little time to learn the lines and to know what was going on. But it was creative and worked well most of the time. Since you weren’t part of the original storyline, which character would you have liked playing from any of the six films in the trilogy and prequel trilogy? Anakin Skywalker. No disrespect to the actor who played him, but I could have done a lot better. It may have been the directing by George Lucas because I have seen Hayden do better in other movies, so it's a toss up. It goes back to what I was talking about with Actors Directors and John Korty. Nonetheless, I felt his Anakin was very weak and not the Darth Vader we all love in the first three Star Wars Movies. Growing up I liked many others had a fantasy about George Lucas using me to play Anakin but that never came to pass and I would have been too old anyway by the time Lucas got around to making the prequels. Anakin would have been a challenge but we all know the prequels did not turn out how all the fans hoped as they were watered down versions of the originals with no teeth to them. 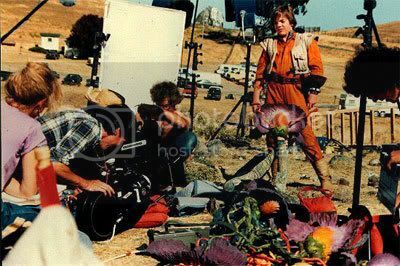 Eric filming a scene cut from the movie. Currently you are working on Star Walkers; your new project. Can you tell what this exactly is? Star Walker is like Star Wars times 1000. It is a much bigger universe then Star Wars and takes place over 12 millennia. Star Walker is like Star Wars, Indiana Jones, Star Trek, Star Gate, and the Matrix all rolled up into one universe. Star Walker started out as a wedding gift from my long-time friend and partner G.K. Holland for my wife Nhu Tran Walker and me in 2002. It is loosely based on my actual life as a child star. The name Star Walker suggests adventures dealing with all of these things on a very grand scale, which is exactly what it does and is. The name Eric Dane is an important character in Star Walker. We see him in the year 2012 from the immense Star Walker Time Line. The name Eric Dane definitely comes from my first name and was meant as a tribute to me from my long time friend, writer and creator of Star Walker, G.K. Holland. From those humble beginnings it kept growing, and now G.K. Greg has more then twenty books, twelve movies, two television shows and a web series in development. We have a official website at www.thestarwalkers.com. In November 2006 we have plans on re-launching the website with the web series. Members will be able to log on and watch a new web show twice a month for a total of twenty-four (18-20) minutes episodes over the next year. The first novel should be out by the end of the year or early 2007. Currently we are doing the Star Walker Radio Episodes that can be heard on the internet every Saturday 9:30 Pacific Standard Time on www.kmlb.com on 'We Talk Back', with Wiley Ezell. In the radio episodes I am the voice of Eric Dane, the character that started it all. Star Walker is sure to excite Star Wars fans because of the great story lines written by Greg. There is already a very bad guy named Sandow 3, who makes Darth Vader look like a cup-cake. He is one bad dude you don't want to be caught alone with in a dark alley. Just ask Kengi Patel, the person he killed in the 3rd Radio Episode. You can listen to it and all the radio episodes on our website at www.thestarwalkers.com. Look for the click here to listen to the radio episodes link. You can also vote for your favorite Star Walker character in a contest we are having. If you want to hear Eric Dane, my character, more then vote for him (hint). You are writing a book called Growing up on Skywalker Ranch. Can you tell us what this book in about and what the Star Wars references are? Growing up on Skywalker Ranch will chronicle what it was like as a teenager to work with George Lucas and everyone at ILM, Skywalker Ranch, and so forth. It will contain a lot of info that no one has ever heard about the inner workings of Lucasfilm. The book starts out with my unique audition that landed me the lead role of Mace Towani all the way up to present day. The book will also contain a series of photographs taken on the set behind the scenes and a part of my private collection. Some of the pictures are of the models used for Indiana Jones, E.T. Star Wars miniatures’ and much more. We plan also to release a Limited Edition Collectors DVD of The making of the Ewok movie shot by Warwick Davis and myself. The book also will put to rest where the Ewok movies belong in the Star Wars timeline, I hope. What a lot of people do not realize is the timeline was change later to put the Ewok movies somewhere between A New Hope and Empire Strikes Back. But while on the set we asked the producer Tom Smith when do the Ewok movies take place and his answer was 150 years after Return of the Jedi. He mentions Wicket is playing with toy stormtrooper wooden figures with Cindel. He said that is also why the Ewoks understand English a little bit. Some years later after a writer put Cindel Towani in an expanded universe novel and then suddenly the time line was changed by people who are responsible for trying to help make everything make sense, probably someone like Steve Sansweet. You have done conventions, but lately it seems you don’t do a lot of them. It’s been quite some time since you have been to Europe for instance. Any specific reason for this? No reason in particular. I have been busy working on a few projects so I have not had as much time to go to many conventions. I also do not do this for a living like a lot of convention regulars you see time and time again. They make their living on it and I do it to meet and greet the fans. Sometimes if a fan does not have money, I have been known to give them an autograph or two. I also donate most of the money to local charities in my area. I have personally witnessed some Star Wars regulars like the Chewbacca guy (editors note: Peter Mayhew), be rude to fans who want him to sign things and I do not like it. Fans are what make you a star and believe me there is a higher price to pay for that kind of attitude. What do you make of the nature of Star Wars fandom? Here we are twenty-nine years later and the franchise is as popular as ever. Were you surprised that Star Wars fans want to meet you at conventions? Absolutely. 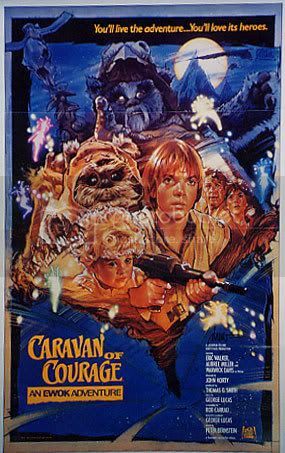 I was told that since Star Wars was a big deal and people would remember this Ewok movie for about a decade. Here we are twenty-two years later after even the Ewok movies and I am doing an interview on your website! Regarding the fans I am truly humbled and it touches my heart that someone would care about Mace Towani or Eric Walker. I really enjoy listening to all the personal stories from all of my fans. It really touches my heart to know that maybe I helped them escape this world if only for a brief amount of time while they were engaged in watching Mace and Cindel try to save their parents. Many of them have shared with me how they would pretend they were Mace while they were playing with friends or other relatives and if I was able to help them by being a mentor or someone they wished they were like, I am thankful to have participated as a positive role model in their lives. You have attended acting classes in the early eighties along with Sean Penn, Noah Hathaway, Corey Feldman and Barrett Oliver. Are you still in touch with them? How were they back then and did you guys dream about regarding acting back then? I am not in touch with most of my classmates. None of the ones you mentioned here. I am in touch with Courtney Gains (Children of the Corn, Sweet Home Alabama) and Byron Thames (Star Trek: Enterprise, Johnny Dangerously). As fellow working actors we always were there for one another. Every time one of us had a movie coming out we would all go out to see it together the night it came out. I remember when Courtney Gains was had a movie called Secret Admirer with C. Thomas Howell and we all went out in Hollywood to a movie theater to see it, when suddenly Crispin Clover gets off the bus at the same intersection. Courtney and Crispin were working on Back To The Future together at the time, so he just happen to see us and ended up joining us to watch Courtney’s new movie as well. So that is just one example of how actors support one another. What would you regard as the highlight of your career so far, and what is the most important thing you have learned in the movie business? At this moment it would have to be working with George Lucas and Lucasfilm. I learned a lot of about movie making from them. But all that is about to change with Star Walker as it will soon replace it. Still, I have to say George was a mentor if you will. He is responsible for my love of film making and editing in particular. If he and Tom Smith did not rent the camera equipment and let us go around the set filming I might not love the art of film making. My hope is that George gets back to just that, the art of film making. I feel he is surrounded by ‘yes’ people and if that is something he wants that is sad. I have many things I would like to say to George and speak to him about which include wanting to work for him on a few projects. I plan on contacting him shortly in fact to tell him about my book and wanting to work for him again. Who knows, maybe he will be back in my future, but I doubt it. I have read so much about his vision with Francis Ford Coppola and see he has lost that vision. I am hopeful about his plans to go back to making movies that he wants to do and I wish him luck. I have also learned that Hollywood will get to you even if you’re George Lucas and you move so far away to escape it. All one has to do is watch the first three Star Wars movies followed by the second three. Then you will see Hollywood or the merchandising machine at its best. The first three movies were made by filmmakers and the prequels were made by the toymakers. That is what I have learned about the movie business. There is nothing wrong with the toymakers as they have their own place. The problem is keeping them out of the film making process and that is something I fight to do. Let them make the toys after the movies are made. You will find that better movies will ensue.